I’ve always had an adventurous palate. I first discovered my love for escargot at the age of six (though not sure of how to pronounce it, I simply requested the snails), and by eight, I happily made a meal out of multiple orders of carpaccio (or what I referred to as the “raw beef with capers”). My appetite for all things unusual has made my culinary adventures that much more colorful… this week’s blog post being no exception. Uni, commonly known as sea urchin, is one of the few things I had to really work at learning to appreciate. The first time I tried it, I was so turned off by its almost slimy consistency that it would be nearly 15 years before I gave it another shot. I’m so glad that I did! Not only have I come to enjoy uni, I love it so much that for my birthday a couple of years ago, my best friend Meredith arranged to have a candle presented on a plate of uni in place of a traditional cake. Weird but true. Uni is something you don’t often find in your local grocery store, so naturally it caught my eye when I saw it in the seafood section of my local market last week. Though at the time I had no idea of how I was going to prepare it, I knew I needed to take advantage of the opportunity and bring some home. 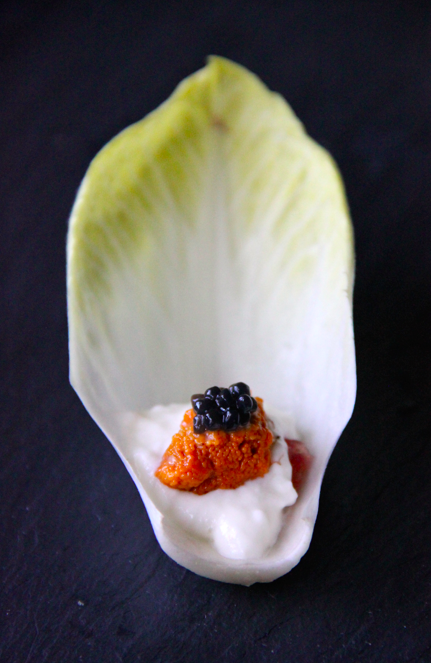 In browsing the market and considering what I knew I had in the fridge, I decided to pair the uni with burrata, blood orange and caviar on a Belgian endive spear. Unlike most of my recipes which are given great consideration and thought, I blended these flavors and textures on a whim. 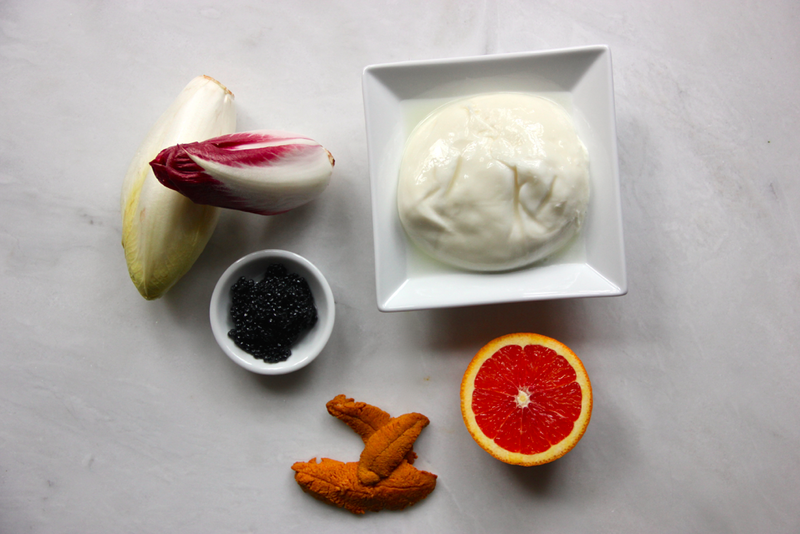 Both the uni and burrata’s creamy and slightly salty properties paired naturally with the sweet, tart flavor of the blood orange, and the endive provided a crisp, natural finish. 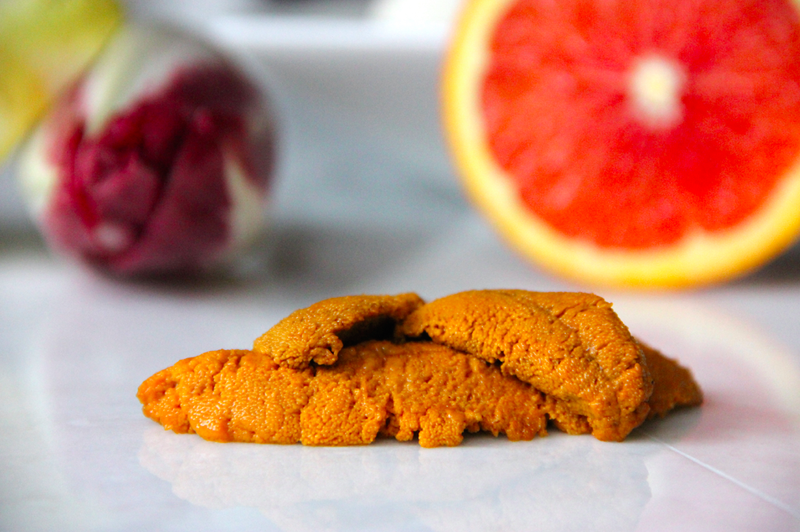 While uni isn’t for everyone, this is an unusual and delightful dish that is sure to spark conversation and intrigue while also pleasing the (more adventurous) palate. Cut off the base of the endive. Separate and wash the leaves. 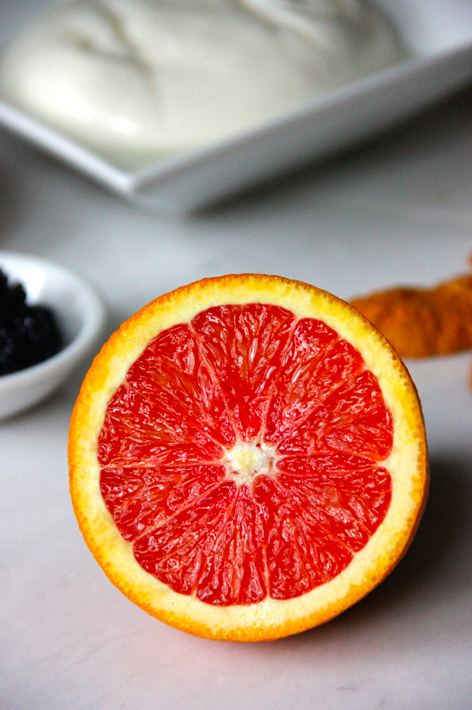 Cut the blood orange into sections approximately ½ inch thick. Using a paring knife, carefully cut and remove 20 sections. 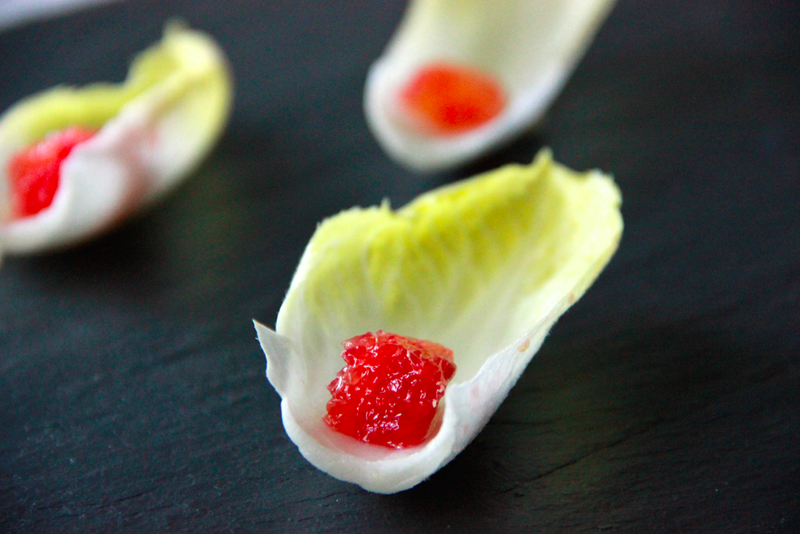 Place one section of blood orange on each spear of Belgian endive. 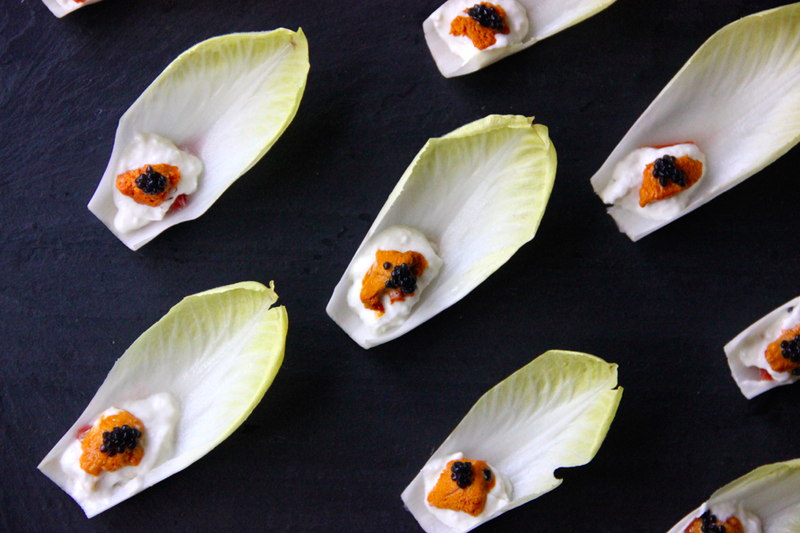 With a spoon, take a dollop of creamy burrata from the center of the cheese, just covering the section of blood orange. 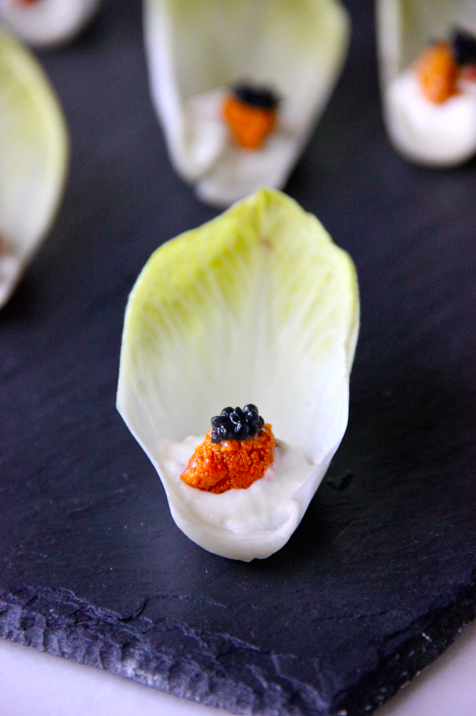 With another spoon, carefully cut a small piece of uni and place on top of the burrata. 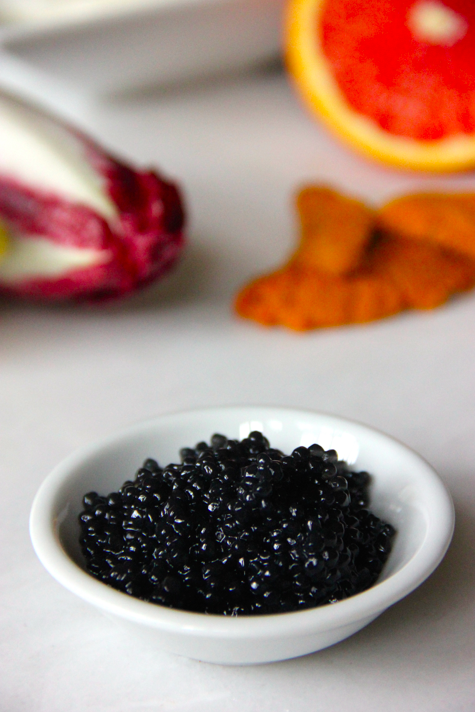 Garnish as desired with caviar. Thank you so much!!! And couldn’t agree more – burrata is the best! !